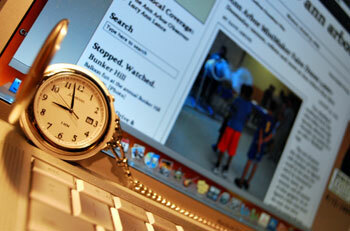 The Ann Arbor Chronicle pocket watch in a totally staged attempt at an arty photograph just for this column. About a year ago, Dave Askins gave me a pocket watch. It’s a lovely device: simple in design, functional, evocative of a different era. The pocket watch holds all sorts of meaning for me, and it wasn’t a random gift – you might have noticed that here at The Ann Arbor Chronicle, we have an affection for watches and clocks. Exactly a year ago today, Dave and I launched The Chronicle – with a watch in its masthead – intending to provide in-depth coverage of issues we felt were important or intriguing to the community. We believe that a critical part of the media’s watchdog role can be played by sticking to a simple premise: Just show up and watch. Observe, listen, notice, revel in seemingly unimportant detail – that’s how you discover what decisions are being made, and why. That’s how you learn about relationships, and how you notice the small things that sometimes turn out to be really important. When we started, we also wanted to have some fun along the way, and make a living publishing The Chronicle. A year later, we’ve done that. And honestly? I can’t quite believe it. We’ve made it through one year because of the support of hundreds of individuals who’ve found value in what we do. Many of you have passed along information to us that we’ve sometimes been able to turn into stories. And many have taken time to post comments on our stories that have added information, analysis, insight and novel perspective. Some of you have taken the time to send along corrections when we got something wrong, and we’ve learned from that. We’ve made it because columnists and freelancers have begun to expand the range of our coverage. And this summer we got a welcome boost from interns, too. We’ve made it thanks to those of you who’ve supported us financially with your voluntary “subscriptions.” I’ll never forget the giddy feeling of getting our first Chronicle check in the mail – now I know exactly why merchants frame the first dollar bill they earn. We’ve made it because of the local businesses and institutions that support us through their advertising dollars, even though their budgets are tight – we’re grateful to you all. So what’s next? It’s tempting to make grand pronouncements on occasions like this, or to set ambitious goals for the coming year. That’s for later. For now, I’ve got some celebrating to do. For those of you who don’t know, Dave Askins – the man who gave me the pocket watch and who edits and writes for this publication – is also my husband. And today, along with The Chronicle’s anniversary, we’re also celebrating our own. One year for The Chronicle seems like a long time; 20 years of marriage seemed almost unimaginable back in 1989. And yet, here we are – still discovering new things, still having fun, still happiest to be in each other’s company. I can only hope that as we watch another 19 years go by, we’ll be able to say the same about The Ann Arbor Chronicle. About the author: Mary Morgan is publisher of The Ann Arbor Chronicle. Congratulations, Mary and Dave. I’ve learned more about Ann Arbor from reading the Chronicle for the past year than I did from living here for the previous four, as both a student and a townie. It’s an honor to know you both. Congratulations, and continued success in your endeavors. You are appreciated by this reader, as I’m sure you are by many, many more. As I just wrote you yesterday when I sent in a small token of support: “I love you guys.” I also sincerely echo everything said in #1, #2, and #3 above. Happy Anniversary, Mary & Dave! A remarkable achievement on both counts. You show us how well it can be done! thanks guys, I love the stories on this site. This is really a remarkable place to visit everyday and you two should be proud of your accomplishments. The coverage is so welcomed and needed in our community! Congrats on the personal front as well. How wonderful to celebrate your wedding anniversary as well. Wishing you many years of both excellent coverage and bliss! We celebrate with you today. The Chronicle makes Ann Arbor a better place. Congratulations! I’m so appreciative of your coverage and just darn glad that you are doing what you do. Congratulations! Where would we be without the Chronicle? Living in ignorance. Here’s to 20 more for you…and for the Chronicle. You do get to do the coolest stuff! Congratulations and thanks for the great work. Keep up the good work. Both of you do a great job in reporting on local government and politics to a depth that has been sorely lacking since I have lived here (going on 10 years). I think you have found your niche and look forward to reading the Chronicle for the next several years. Congrats, and thanks so much for your contributions to making Ann Arbor a better (and better informed!) place to live. You are appreciated! Congrats on your anniversaries, you both do a great job! congrats on both anniversaries! looking forward to many more years of the chronicle. Happy anniversaries! You are indispensable, jointly and severally. Keep it coming on all fronts. Thank you for a valuable service. Happy Anniversaries on both accounts! Thanks so much for sharing your excellent journalistic skills with us – you truly have enriched the Ann Arbor community with your thoughtful, thorough, and balanced reporting. And thank you for sharing your personal milestone with us – you have invited us to be a part of your world, just as you have enriched ours. Congratulations on both of your anniversaries! I’m looking forward to many more! And thanks for bringing us The Chronicle! It’s an invaluable service to our community, and I’m delighted to see it succeed as a viable venture, too. May you (both in work and love) live long and prosper. Gosh you guys are great! I’m sure grateful for your efforts. What’s next? A little time off maybe? Happy Anniversaries! Happy Anniversary(ies)Dave & Mary! Your work fills my head with wonder at what I could & should be doing! Congratulations on both anniversaries. This is a terrific site. And you are terrific journalists. What a happy marriage of people and public service! Sometimes it’s hard to fathom that writing this articulate about local issues goes on in Ann Arbor. Our community is lucky to have you two.